I love inviting people over for meals. Perhaps this is a legacy passed on from my parents. Deta (my dad) used to invite people for lunch or dinner at the drop of a hat, although he found it extremely difficult to visit others’ homes for the same. Every weekend my mother would be found slogging at the kitchen, preparing an elaborate spread. From soups to desserts, everything would be made from scratch. Later, when we sisters grew up a little, we were able to help Maa in her chores. I would make the salad and sis would make the dessert. Sometimes, I would make the raita and sis something else. Deta had his own specialty – sweetcorn soup. At that time, I used to wonder why is it that we have to keep feeding others. Was it really necessary to cook so many dishes? I had put this question to Maa once and received a sharp rebuke. Today, I know the worth. My heart fills with pride every time I see appreciation of my food on the face of my guests, not necessarily in words. The food I cook may not be as expansive as the ones at my parents’ house, but they are by no means ‘thoughtless’. Since I do not have the luxury of cooking at leisure with a hyper-active baby in the house, I try to keep my dishes very simple and hassle-free. 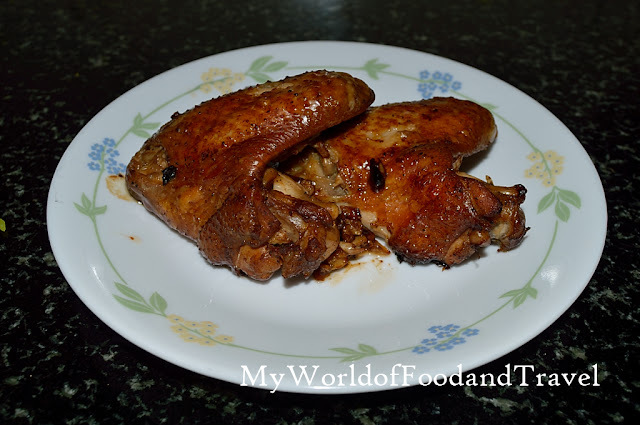 Today’s recipe is one of our favourite starters when we have guests over. It is easy; do not require much preparation and you can continue with your other work. ½ kg Chicken wings – washed and patted dry. You can cut off the tips, I kept them. Combine all the ingredients with the chicken wings except the oil, butter and honey and keep aside for around 2-3 hours. Be careful about the salt as all the sauces have high salt content. Pre-heat the oven at 200 degrees for 10 minutes. In the meantime, cover the roasting tray with silver foil paper and glaze it with some refined oil. 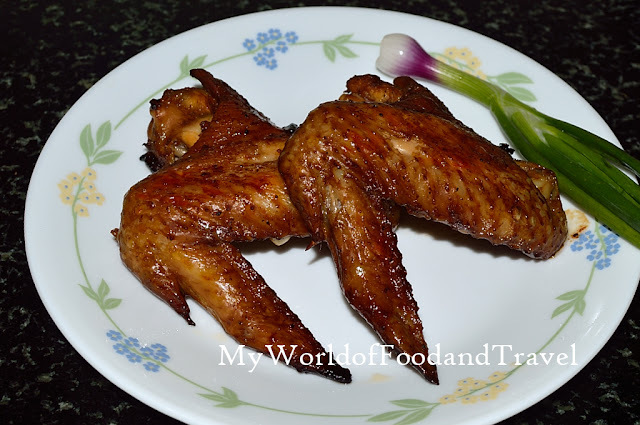 Arrange the chicken wings on the tray and slather some butter on them. This will keep the chicken moist. Put the tray in the middle rack of the oven and grill for 20 minutes. Then take them out, flip them over and drizzle some honey. Take care not to overdo it though! You can put some more butter if you wish. Now, transfer the tray back to the oven, but this time on the top rack for around 5 minutes. 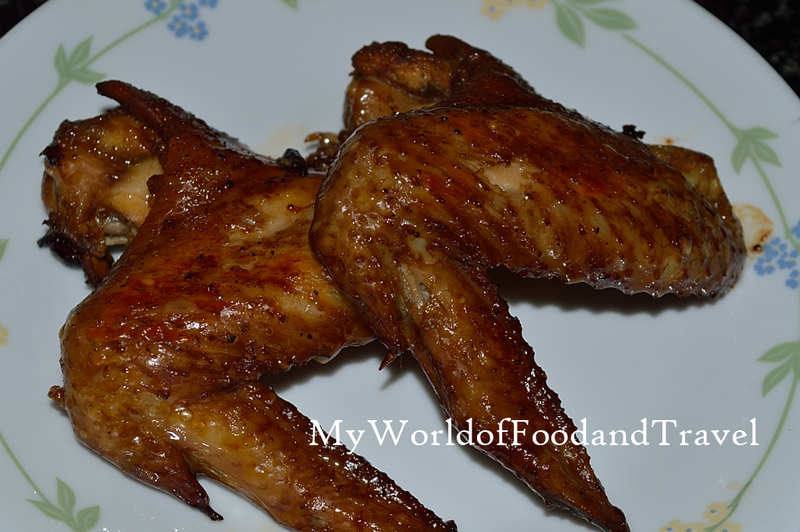 The chicken wings will have a nice charred look to them when they are done. Now, how long did this take you? An absolutely no-sweat, yet delicious dish. Serve them with sauces and chutneys of your choice. 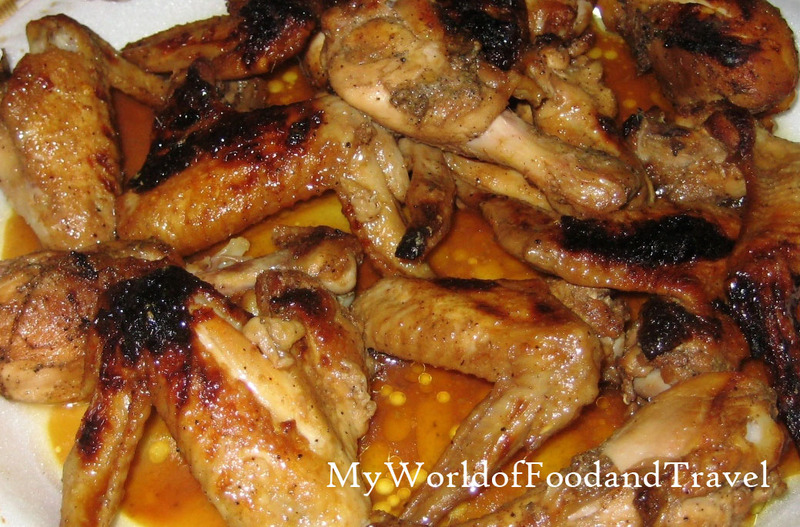 I have another old, but unappetizing picture of the wings with me when I had made them the first time, clicked long before the present camera came into our lives. How about giving this a try the next time you have guests at your place?